Do AC/DC want to send the Curlew on the Highway To Hell? Throughout their career, AC/DC have slayed audiences with louder-than-all-get-out stage shows. But who knew the band could wipe out a rare bird species? According to Hans Uhl of the animal rights group BirdLife, the sound levels generated by AC/DC concerts are excessive and pose a threat to a bird known as the Curlew. Uhl has started a campaign to put a halt to a concert by the group at the Wels Air Field in Austria scheduled for 22 May. Curlews can be found in select regions of the world, including the town of Wels, which is a particularly favorite nesting ground for the rare bird. "The second biggest colony of Curlews in Upper Austria and various other ground-nesting birds must not become endangered," Mr Uhl said. Uhl might be in for quite a fight, however, as all 80,000 tickets for the concert were snatched up within hours. 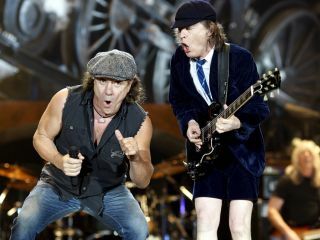 The staff at MusicRadar has attended more than their fair share of AC/DC concerts over the years. Aside from the usual hangover and ringing of the ears (all gone within 24 hours), we've never experienced any serious adverse effects. All Ears states that 140 dBs, consistent with a "gun shot blast" or the sound generated by "a jet engine," can result in "instant hearing loss without hearing protection." As for 150 dBs, that which can be heard while standing near "a rocket launching pad," well, both humans and those cute little Curlews might be in for rough times.